van der Hoeven, F., & Wandl, A. (2013). Amsterwarm: Gebiedstypologie warmte-eiland Amsterdam. Delft, Nederland: TU Delft, Faculty of Architecture. Ostir, K., & Kokalj, Z. (2011). Sky-View Factor as a Relief Visualization Technique. Remote Sensing, 3(2), 398-415. VAN DER HOEVEN, Frank; WANDL, Alexander. 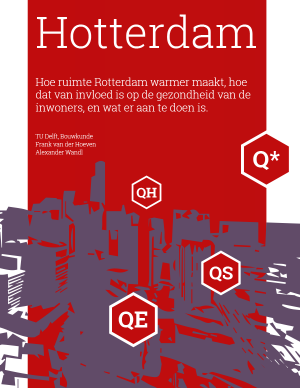 Hotterdam: How space is making Rotterdam warmer, how this affects the health of its inhabitants, and what can be done about it.. BK projects, [S.l. ], v. 1, n. 1, jan. 2018. Available at: <https://journals.open.tudelft.nl/index.php/bkprojects/article/view/1972>. Date accessed: 26 apr. 2019.